I would like to thank Disney Australia for providing us with the rad prizes! Have a good christmas everyone, enjoy the movie and see you all in 2013! Hey everyone, it’s competition time! How would you like to see the new Disney film Wreck-It Ralph? 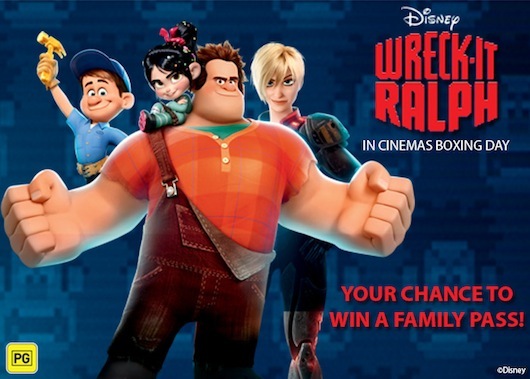 To celebrate the Boxing Day release of Disney’s Wreck-It Ralph, Retrospekt in association with Disney are giving you the chance to win one of three family passes to see the film. To be in the running all you need to do is go to our contacts link or Facebook page, or even comment below and tell us who your favourite retro video game villain is and why. Offer is only valid at participating cinemas. Not valid for Gold Class; Special Event sessions, Vmax at Village Cinemas. Not valid for Gold Class, Vmax at Event Cinemas. Not valid for Gold Class, Vmax at Greater Union and Birch Carroll & Coyle. Not valid for La Premiere, Directors Suite, Bean Bag Cinema, Xtremescreen or IMAX at Hoyts Cinemas. Not valid at Reading Gold Lounge, Titan XC. Not valid at Ace Gold Lounge and Hayden Orpheum Cinemas. Not valid public holidays, all day Tuesday, discount days or Saturday after 5pm. Not valid with any other offer. Not transferable, exchangeable or redeemable for cash. Valid throughout the theatrical season. ‘No free ticket’ restrictions do not apply. Competition valid for Australian residents only.